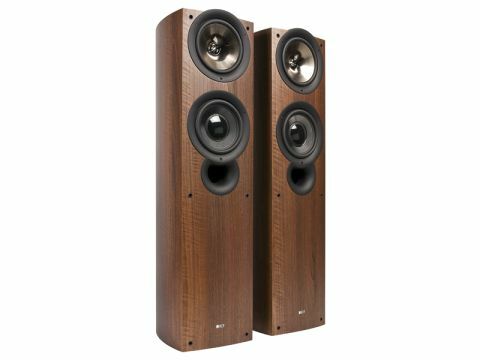 Conceived and designed in Maidstone, Kent, but manufactured somewhere in China in order to keep the selling price competitive, the iQ70 carries an official price of £800 per pair and is closely related to the iQ50. Indeed, viewed in isolation it would be difficult to identify one from the other, though placing them side by side clearly shows that this more costly model has a slightly larger enclosure and the next size up in main drivers – 165mm rather than 130mm. The Uni-Q driver that gives this model its name is a variation on the co-axial theme, positioning a tiny 19mm tweeter on the pole-piece in the centre of the bass/mid driver's 120mm polymer cone. The Uni-Q driver has been steadily developed since the 1980s and the particular innovation in this latest variation is a 'tangerine waveguide' around the tweeter. This consists of eight small vanes extending inwards from the outside edge of the tweeter dome, an arrangement that helps the dome more closely approach the pulsating sphere ideal. Other improvements for the latest generation include re-mapped crossovers and a new bass driver with a 115mm 'dual composite' cone. A front port provides extra bass reinforcement and shaped foam bungs are supplied to block this if desired, though in practice this seems unlikely. The enclosure back and sides form a continuous curve, which looks attractive, should improve overall stiffness, and avoid focusing internal lateral standing waves. The front panel is very gently curved, too. At standard price the enclosure is finished in walnut, dark apple, or black ash vinyl woodprint; real wood veneers are available for an additional £200. A moulded black 'bump' covers much of the top surface, matching the curve of the Uni-Q driver frame. The speaker is supplied with an attractively shaped moulded plinth. This feels a bit lightweight, but holds the spikes securely in place and also helps the speaker's overall physical stability. Twin terminal pairs come connected by wire links (rather than brass strips), which is another worthwhile bonus. Although the in-room measurements show ample output throughout the bass region, even when the speakers are positioned well clear of walls, the iQ70 still somehow manages to sound a shade small and a bit weak in serious bottom end drive and authority. There seems no obvious explanation for this, but it does suggest that a little wall reinforcement might be beneficial and that the port bungs are unlikely to be helpful. Although the overall character is mostly smooth and well balanced, it only serves to make the measured peak in the upper midband that much more obvious. At low listening levels it might be considered something of a bonus, as it tends to emphasise detail and vocal articulation. Start winding up the volume, however, and the speaker begins to start sounding a little aggressive and less comfortable, while the slightly pinched and nasal voice coloration becomes more obvious and intrusive. The top end sounds smooth, sweet and attractively open, stereo images are precisely focused and any enclosure colorations as such seem to be very well under control. While the basic dynamic range is good, dynamic expression and vigour did seem a little weak.